IS-AP Team kindly invites everyone in Indiasudar to the meeting on this sunday (17th Apr 2011) in Hyderabad at below address. New Generation’s DegreeCollege, (Opp to Wesley Women’s degree college). Your participation will be appreciated as IS-AP Team is very new and we definately need your guidence to move ahead. Please contact below members if you have any doubts. In the attachment, you will find a more detailed costing (.pdf) of this project. Please feel free to share this with your friends/corporate network for funds to execute this project. We seek your help/support in this regard. Also, there is a pamphlet (.jpg) attached that you may use as an advertisement material. IMPORTANT – YEARLY PLAN What we are going to do in Year 2011-12 ? 1.What we did till date (Feb-2004 to Mar-2011) ? 61,990 students benefited through our 6 type of the projects. 2. What we are going to do in year 2011-12 ? Note: Refer attached excel for complete year project plan. 3. How we will get Rs.25,83409 ? Rs.15,49,013 will be India Sudar fund. This will come from India Sudar members and partners as a donation. Rs.10,34,396 will be raised by every state team locally through different type of the fundraising activity. This amount target may go up/down based on the team performance. This may affect total number of projects also. 4. How you can reach this Goal as a Member ? You can work as work-coordinator to initiate, execute, review and control the project. You can work as project, district, onsite Lead to execute the projects. You can donate your 24 hrs in a year, towards any specific activity as a volunteer. 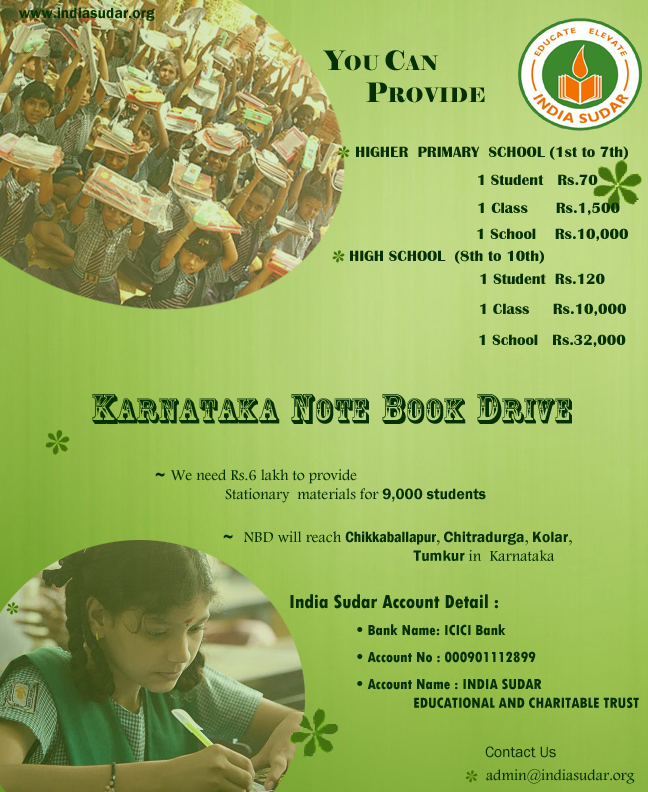 You can donate small money to India Sudar for projects (Every Month). You can fund for any selected project completely or partially. You can spread India Sudar activity in your friends/office network to bring more member & fund. You can post any education requirement(from village, gov school, home and individual) to India sudar. You can participate in any fund raising activity. 5. Let’s work together to reach our vision. I am sure, your small contribution(time & money) will make BIG change in rural students education and there life. Following is the report for our site visit on 2nd Apr 2011. A special thanks to Uday and Elango for inviting me. At the onset let me state that this was my first visit to this site and my second visit overall as a volunteers of India Sudar to any site. The earlier one was New Life in Tambaram. Even though I was well prepped through multiple discussions with Karthik, Prem & Uday to expect a well organized and maintained home for boys @ Chengalpet, in reality this place way exceeded my expectations that I had from a government run organization. My prior notions, ignorance and low expectations were greatly influenced by details I had read about such places in print media and image portrayed in movies. Before this visit, a government run home had a whole set of negative idea and bad stigma associated with it and this visit has helped clear many such feeling. The officials at the home were surprisingly very friendly and eager to have us in that place and this should be greatly attributed to the work that India Sudar has been doing at this place. Be it the computers that have been set up or the two wheeler mechanic training center, all initiatives done so far have been well received and appreciated by the boys living in the home and their officials. After the initial interaction with the officials, the boys were quickly organized into a room to facilitate the interaction with India Sudar volunteers. If were to ignore the fact that these boys are here for having been on the wrong side of law, they turned out to be a bunch of regular school going kids, very chirpy, pulling each other legs and as usual very shy to express their needs and thoughts. But once the initial ice was broken they started becoming more vocal about their needs and aspirations. But one thing that stood out lacking in a big way was lack of self confidence and self esteem and this was acknowledged by the officials too. This is where we as volunteers can help with our valuable time. Just interacting with these kids on a regular basis will help bring in more hope and provide encouragement for them. More thoughts about this in the plan and activity section below. After Uday took down a list of training needs and ideas directly from the boys themselves, the Superintendent took us around the home and showed us a newly renovated room that he plans to use as classrooms for the boys. After this we had further discussions with him in his office room where he introduced us to a possible candidate who can teach basic computers, DTP & Photoshop to the boys using the computers that has already been donated. The same candidate also mentioned that he can get us details regarding people who can train boys to prepare fast foods (parotta master job). All these will be channelized through the Superintendent. 6. The biggest requirement among all these is requirement for volunteer time to interact and mentor a specific set of boys. Sport & Music Accessories: To be provided after necessary fund approval.